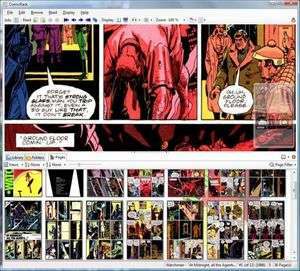 ComicRack is a tool enabling you to read your electronic comic book formats such as CBZ, CBR, CB7, CBT, PDF, DJVU and WebComics. If you're a comic book fan and have a collection of them on your PC, then ComicRack is a good program providing you with an effortless way to enjoy reading. It organizes your library of eComics and provides a useful search function along with advanced tagging and editing tools. The application runs without issue and is extremely smooth along with its many graphical features. Version 0.9.177 is a freeware program which does not have restrictions and it's free so it doesn't cost anything. For security reasons, you should also check out the ComicRack download at LO4D.com which includes virus and malware tests. Additional screenshots of this application download may be available, too.